The genius of Deepening Year for Direction Ministries (DYDM) is in providing the community and the context for taking the work of spiritual direction deeper. 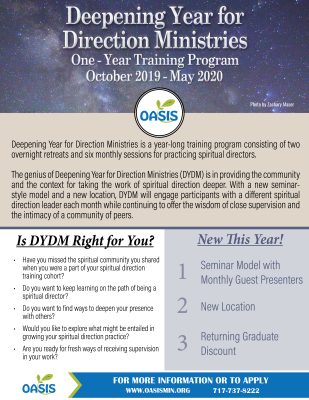 With a new seminar-style model and a new location, DYDM will engage participants with a different spiritual direction leader each month while continuing to offer the wisdom of close supervision and the intimacy of a community of peers. A seminar presentation by a guest spiritual direction leader on a theme that is vital to the presenter. The experience of a variety of spiritual direction styles as each month’s guest directs another in a real play. Engagement with themes through seminars and guided retreat times. Is DYDM right for you? 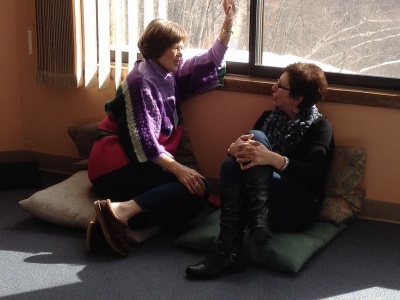 Have you missed the spiritual community you shared when you were a part of your spiritual direction training cohort? Do you want to keep learning on the path of being a spiritual director? Do you want to find ways to deepen your presence with others? Would you like to explore what might be entailed in growing your spiritual direction practice? Are you ready for fresh ways of receiving supervision in your work? If the application is received by May 31, 2019, the participant will receive a discount of $100 from their tuition. If the application is received after August 31, 2019, $75 will be added to their tuition fee. ​​If withdrawing prior to September 1, a full refund of tuition already paid will be returned, less $50 to cover administrative time and processing. ​Payments by check or credit card (MasterCard, Visa and Discover) are welcome. If paying via installments we anticipate the first payment to be $350 (plus $75 if application was received after August 31, 2019, minus $100 if application was received prior to May 31, 2019). The first payment is due upon acceptance into the program (by September) and payments of $335 monthly October- April. Complete the DYDM application. Participants who are graduates of the Oasis Ministries SDSG or DYDM program are still asked to complete the DYDM Application. Ruth Workman (SDSG DYDM), EdM, MA, has a certificate in Spiritual Direction as well as a certificate in Supervion of Spiritual Directors. She has offered Spiritual Direction since 1995. Ruth is a teacher in the Deepening Year for Direction Ministries and a peer group leader for Spiritual Direction for Spiritual Guides years 1 and 2 through Oasis Ministries for Spiritual Development. She has a private practice in Spiritual Direction and offers individual and group Spiritual Direction to students, faculty and staff at Princeton Theological Seminary. Ruth leads Ignatian and contemplative retreats at The Sanctuary, her home in Stone Harbor, NJ. Mary Lou Hatcher has a certificate in Spiritual Direction from Oasis Ministries. She received a BA in Religious Studies from the University of Virginia in 1977, and an MA in Religious Education from the Presbyterian School of Christian Education in 1980. 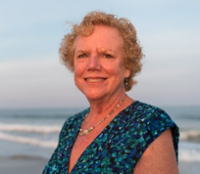 She has been practicing with Quakers since 1988 and has served the Philadelphia Yearly Meeting judicatory as clerk of the Children's Spiritual Life Committee. Mary Lou is married and has two step children, two biological children and one fabulous grandchild. In her own spiritual life Mary Lou practices a contemplative silent worship desiring a clear mind, an open heart, and a humble willingness to respond to God's presence. As a spiritual director/guide she sees herself primarily as a witness to the Spirit's leading in each of our lives and as a support for the many ways we "make Space" for that divine work.